You know the general Yankees fan base is bored when off-the-wall ideas and trade proposals start coming to the forefront but sometimes there’s an idea that just makes sense and sometimes there’s an idea or two that simply work, and subsequently stick. 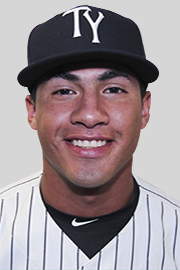 This I am hoping is one of those ideas as the general consensus seems to be that Gleyber Torres, the main piece the Yankees received back in the Aroldis Chapman to the Chicago Cubs deal from the 2016 season, will make his presence felt in 2017. Now with this hypothetical emergence to the show from Torres in 2017 many fans are left wondering what the Yankees will do with incumbent second baseman Starlin Castro but have no fear Yankees family, I have an idea. Now I know that Torres is a shortstop by trade but the Yankees seem happy with Didi Gregorius at the position and I would be inclined to agree with them. He’s been great, Castro has been good but he hasn’t been great which makes the decision an easy one for me. The free agent market at basically every position right now is thin so why not take advantage of that and trade Castro away for a new slew of prospects to drool over? OR the team could simply dump third baseman Chase Headley, he does not have a no-trade clause written into his contract, while moving Castro to third base and sliding Torres in at the second base position. Now don’t get me wrong, this is not going to happen outside of spring training. Sure, Torres tore up minor league pitching in 2016 and continued that against advanced talent down in the Arizona Fall League this season but Torres is likely to start at Double-A Trenton with the Thunder as 2017 opens up, not in the Bronx and not against the Tampa Bay Rays. This discussion and idea set is more geared towards maybe July 2017 and is contingent on if the Yankees are in contention or not and absolutely not geared towards Torres breaking camp with New York. I mean if he tears up the spring camp and manager Joe Girardi wants to bring him to the Major Leagues for Opening Day, more power to him. I’m just not that confident, yet. There’s no need to rush the 20-year old Torres by any means but if he’s ready the Yankees shouldn’t let a veteran contract or two get in their way of calling him up. Headley can be moved and Castro is willing to play third base, he’s said that as recently as the 2016 season, so don’t hesitate. Do it. I'll buy into that Daniel!